You can setup your branding in Settings / Branding. 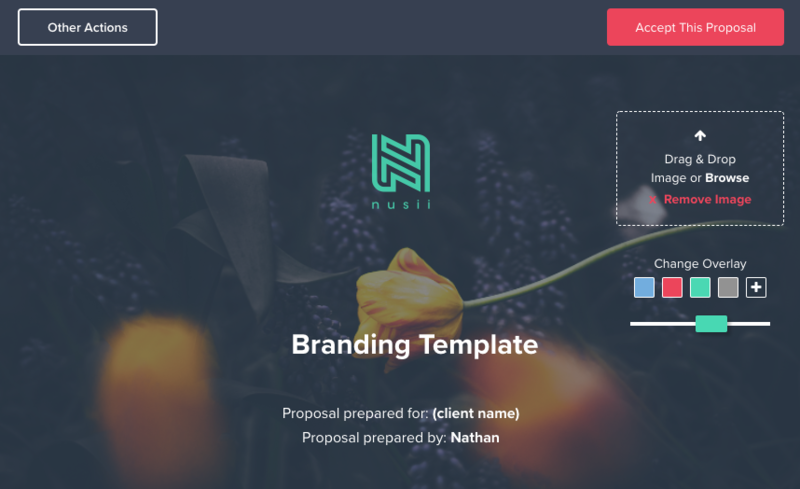 We have kept our branding options as streamlined as possible, meaning you spend less time designing, and more time getting proposals out the door. 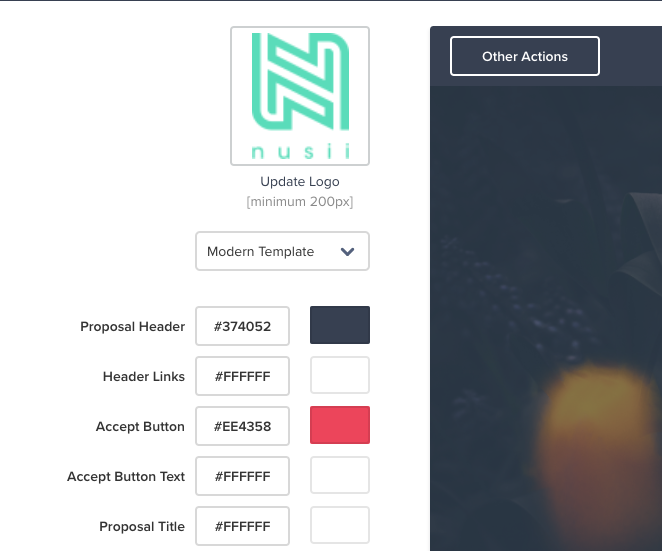 To upload your logo, simply drag-and-drop an image of at least 200px x 200px to the logo upload area. This is situated in the top left-hand side of our dummy proposal. If you prefer to search your computer for your logo, Click on 'Update Logo'. This will open a browser window that will allow you to search your local files. 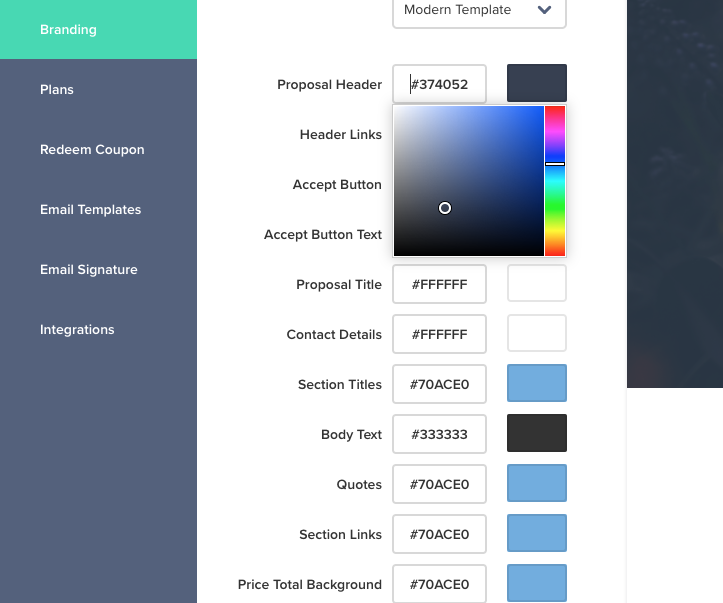 All the colours you can customise within your proposals (text, buttons, header areas etc.) can be found on the left-hand-side of our dummy proposal. If you know the HEX of your company's colours, you can simply type them into the appropriate input field. We also provide a colour picker. This can be accessed by clicking on the colour block to the right of the descriptive tags. You can update the standard header image by dragging the image of your choice into the header area. If you prefer, you can search your computer to find the appropriate image by clicking 'Browse'. Please note that any image you upload here will be used across all future proposals, not proposals that have already been sent. You can however, customise new proposals on a per-proposal basis. There is no specific resolution you need to adhere to as our proposals are responsive. You can adjust the background overlay colour and transparency by using the 'Colour Blocks' in the header image area. 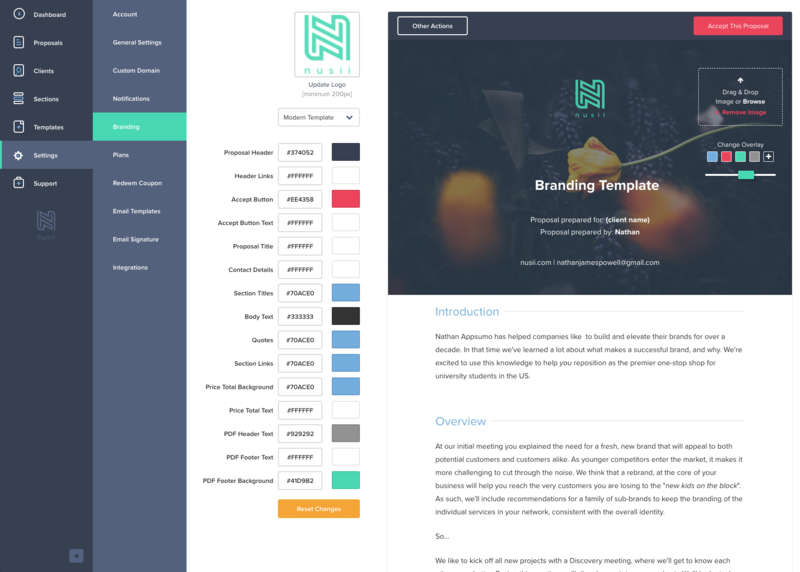 By default we will automatically add your dominant branding colours, making things just that little quicker. You can adjust the transparency by moving the slider to the left or right.